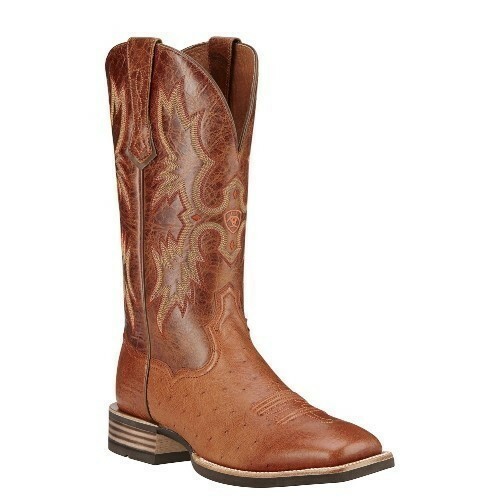 Ariat style 10016277 is part of their Tombstone collection. The Brandy Smooth Quill Ostrich foot looks great with jeans of any shade, Wrangler Riata’s, and your typical dress slacks. This leather is easily maintained with a leather conditioner, such as Apache Cream, but you can always use a cognac boot polish that contains wax if you feel like you need to add a shine. These boots are perfect for any occasion. You can wear them to the ranch, office, church on Sunday, or to a wedding. Ariat’s Advanced Torque Stability (ATS) system provides superior lightweight stability and cushioning. The system consists of a moisture-wicking footbed with gel pads for added comfort and shock absorption, and a composite forked shank for stability. Ariat’s Duratread Outsole is a specially formulated carbon rubber that is highly resistant to manure and acidic waste, without sacrificing traction.